HEIGHT: 20 to 30 feet. This tree can grow to as much as 40 feet. NATURAL HABITAT AND PREFERRED SITE: Eastern third of Texas from the Piney-woods into northeast and central Texas spreading across the center of the state. Redbud will grow in a wide range of soils in the full sun or as an understory tree. IDENTIFICATION INFORMATION: The overall look is that it is a small tree with a spreading and rounded to irregular crown. Eastern redbud is the largest of the redbuds and is usually single trunked. FLOWERS AND FRUIT: Various shades of lavender, purple or white flowers in the early spring before the leaves start to emerge. Flowers are about ½ inch in length and occur in clusters of 4 to 8 on older branches, often along the trunk. The buds are beautiful even before the flowers open and are more tasty eaten at this point. Fruit forms in clusters of flattened papery pods that range in length from 2 to 4 inches, ripen in the fall. Dark shiny seeds inside are about ¼ of an inch long. 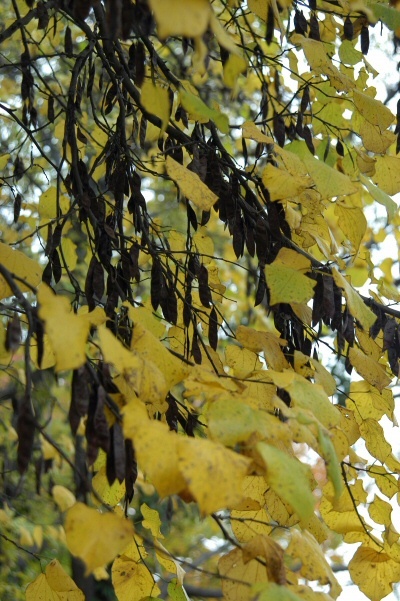 Pods remain on the tree throughout the winter. BARK: Tight and thin, ranges from light gray-brown when young to reddish brown turning a darker gray to almost black with age. The trunk eventually becomes scaly and separating into narrow ridges with maturity. FOLIAGE: Alternate, simple, deciduous, yellow fall color that is usually less than spectacular. Leaves are 3 to 5 inches long, dark green on top, lighter on bottom, distinctive heart shaped, dull in texture. 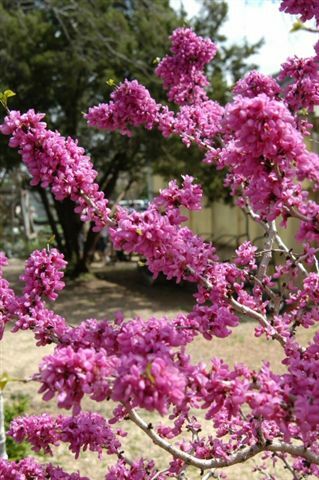 CULTURE: Redbud is easy to grow in a wide range of soils from sandy up to very rocky alkaline, white limestone rock. The plant is drought tolerant and doesn’t need a lot of fertilizer although it responds to a good fertilization program. PROBLEMS: Borers, leaf rollers and other minor insects attack trees that are in stress. Leafminers can also be a minor problem. PROPAGATION: Redbud is easily grown from seed. Collect the pods in the fall when they first mature, pea weevils can find them and attack during the winter if left on the tree. Many of the seed will be infertile, collect a large quantity of seed and separate them by throwing in water. Sound seed will sink, poor seed will float. Air dry the seed, store in sealed containers at room temperature for one year at 41 degrees if the seed are to be kept longer. Seed can be scarified with acetic acid or strong vinegar solution and then stratified at 41 degrees for 30 to 60 days. Seed will generally germinate in 3 weeks. Cuttings can be taken from juvenile wood or root sprouts in the late spring and summer. Softwood and semi-hardwood cuttings are somewhat difficult to root. INSIGHT: Cercis canadensis var. mexicana is the Mexican redbud. It generally grows to 20 feet in height and is multi-trunked. It likes the hard alkaline soils of west Texas. Its leaves are smaller than those of Texas redbud and crinkled around the edges. The cultivar ‘Oklahoma’ is apparently bred from this tree. 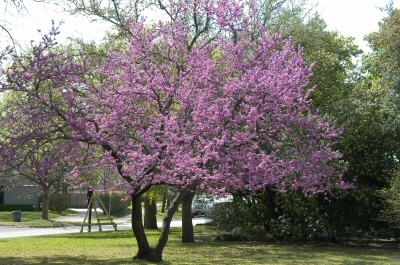 Texas redbud, Cercis canadensis var. texensis, is common on the thin calcarious soils from central Texas going west of the Dallas/Fort Worth area. Its leaves are thicker, dull blue and leathery or shiny dark green on top. Its twigs and leafstalks are smooth whereas the Mexican redbud twigs and leafstalks are hairy. Redbud in bloom in spring. Redbud fall color and seed.